Our sewer line specialists will diagnose your sewer problems fast, then design a solution specifically to fit your needs. We’ll make sure you get the fix you need fast, so you can get back to your daily routine. If you are having sewer problems, time is not on your side. These problems may start out small, but they can get big fast. If you suspect a need for sewer pipe repair, call us at Rowell’s Services today. Our skilled sewer specialists have the technology and experience to perform a minimally invasive repair and get your home working the way you need it to fast. If you have a sewer leak, you may dread calling a plumber. 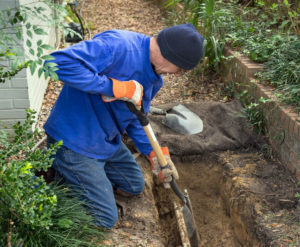 After all, in years past, sewer leaks meant having someone come in and dig up your entire yard until they found the problem. We find the leak. We’ll send a camera and a flexible cable down through your sewer line. This allows us to see the problem and to know exactly what it looks like and where it’s located. We’ll insert a special tube in your pipe. We’ll make sure that this is big enough to cover the entire leaky area. We’ll inflate the tube. Once we have it in place, we’ll inflate the tube we’ve inserted. The tube sticks to the inside of your pipe. It’s covered in a special resin, designed to create a strong and lasting bond with the material your pipes are made of. The tube cures. This process allows the resin on the tube to fully adhere to the inside of your pipe. It basically creates a new pipe that is free from cracks or leaks. The new pipe is durable and long-lasting, so you won’t have to worry about getting your sewer pipe relining done again anytime soon. Pipe relining works best for leaks, but don’t worry! If you have a clog or a backup, we have other less invasive methods available for getting those out, too. Just call us as soon as you realize you need a sewer pipe repair and we’ll find the best solution for you! In addition to saving your yard and saving you the cost of redoing your yard, pipe relining has a few other advantages, too. It’s less expensive than traditional sewer pipe repair. Since we don’t have to call in the backhoes and the dig team, you don’t have to pay for them. Pipe relining comes with a warranty. Depending on the type of liner that we are able to install for you, you can have anywhere from 10 to 50 years worth of warranty on your pipe relining. If something goes wrong with it, the manufacturer will replace it, free of charge. If you think that you might need sewer pipe relining, call Rowell’s today. We’ll get you the answers you need fast, so you can know exactly what is going on with your pipes, what it will take to fix them, and when you can expect the repair to be completed. Get your home back to full working order today when our expert plumbers are on the job!